German police have raided the homes and offices of two people suspected of planning to kill leftist politicians. The pair, one of whom is a policeman, were unhappy with the government's policies towards refugees and migrants, the federal prosecutor's office said. They had drawn up a list of named targets, it said (in German). Neither suspect has been arrested. In 2015, Chancellor Angela Merkel opened Germany's borders to hundreds of thousands of migrants and refugees. The decision divided the country but Ms Merkel said in a recent interview that she did not regret it. The policeman under suspicion worked in Ludwigslust, in northern Germany, about 90 miles (150km) north-west of Berlin. Disciplinary measures have been taken against the man, authorities in Mecklenburg-Vorpommern state said. 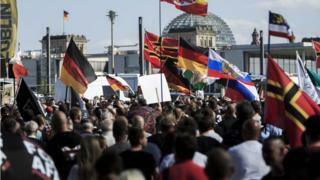 The pair are said to have feared that Germany's immigration policies would lead to attacks and hurt the country. They are being investigated on suspicion of planning "serious violence threatening to the state", the prosecutor's office said. It added they had begun to stockpile food and ammunition. "The accused saw the crisis they had feared as an opportunity to capture representatives from the left of the political spectrum and kill them with their weapons," it said. Raids were also carried out on properties belonging to people connected to the two suspects. Germans go to the polls in late September, and Mrs Merkel is seeking a fourth term in office. Her immigration policy has fuelled the rise of Alternative for Germany (AfD), a far-right party which could win up to 10% of the vote, according to some polls.